In celebration of the anniversary of Dr. Seuss’s birth, here is a video byCollege Humor providing a realistic remix of Dr. Seuss’s classic “Oh, the Places You’ll Go!” Click here to view. ‘Minding my business,’ I stumbled upon an enticing entry in writer/editor Andrew Hearst’s Panopticist blog. 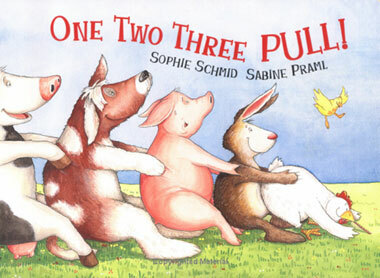 I giggled at the assumption that the cute animals on the cover of Sophie Schmid and Sabine Praml’s picture book One Two Three Pull! are engaged in an act of bodily sharing. This is a serious accusation. Obviously a joke, it’s one that makes you wonder if the illustrator, editor, book seller, and even officials at Barnes & Noble ever watched a late night HBO special on the ‘birds and the bees.’ Maybe they’re just that innocent. I’m jealous. I’ve made it a hobby of looking for a joke in everything. Some people tell me to “grow up,” or “act mature” but that’s just the thing, “I have,” and “I do.” If I were still a kid, a good innocent kid, I wouldn’t have the life experience to pull from to make such goofy/pervish assumptions. This is why I love writing for children. They aren’t looking for ulterior motives or innuendo. Kids simply want to be entertained. If I’m writing for adults, I have to worry about double meanings and offending someone. If only children held jobs in the publishing world. When writing or illustrating for youngsters do so with innocent eyes. No matter what you create, someone has the ability to put a controversial spin on it. And if they do, instead of being defensive, laugh it off and perhaps enjoy the royalties of a boost in sales. Frank Stallone sings a heart-felt song to his daughter about how they’re turning her room back into the computer room. Sure this dilemma isn’t ideal for a children’s book, but it’s intriguing and thought-provoking. Why not embrace an alternative look at a father-daughter relationship, and treat yourself to a few laughs. Note to illustrators: If you ever draw a girl who looks like this one your book instantly becomes so scary even R.L. Stine would take notes. That girl is so frightening! Children love to draw. Adults love to lie. With his ‘outside the lines’ crayon sketch of a peanut butter and jelly sandwich, Jeremy believes he’s the next picasso. While his piece shows for a limited engagement at the Kitchen Gallery (aka the refrigerator) Jeremy is looking for attention and praise. As such, his parents drown him in a storm of white lies. “Is that peanut butter purple? How abstract and interpretative. Well done son!” Though what Jeremy and all juvenile artists need is criticism. Enter Maddox, a 32-year old computer programmer (so says his website) who provides a refreshing slice of life kids rarely receive from their love-blinded family. “I Am Better Than Your Kids” supplies a sampling of children’s art along with honest yet humorous assessments. This is a must-view website for any children’s writer looking to take a brief break to laugh at the expense of their audience. When it comes to children, honesty may not be the best, but its certainly the funniest policy. 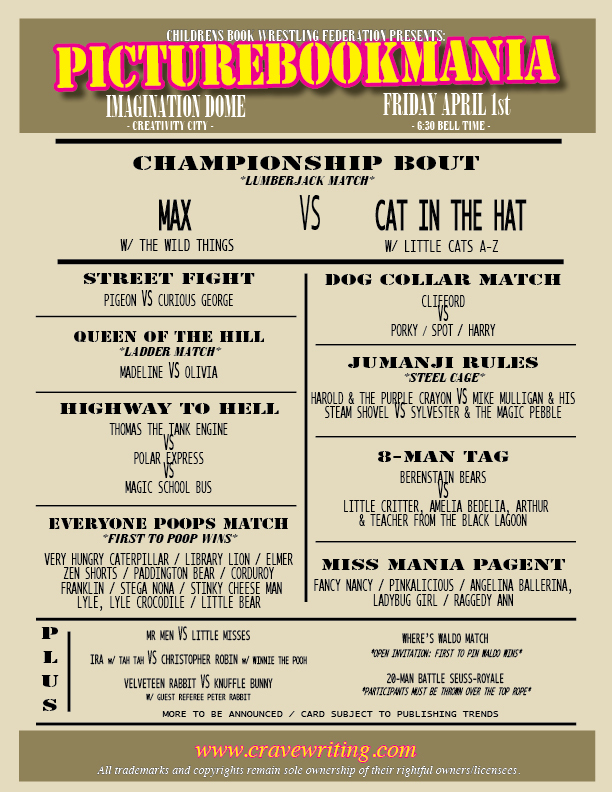 Please be warned as some critiques include foul language. WARNING: This post may not be suitable for children or the tame at heart. Tirelessly rummaging through bookshelves for inspiration, sometimes we need a break. One within our realm. And what better relief than a laugh, especially one at the expense of Children’s Literature. At first glance, this creatively charming production raises eye-brows but in the end delivers a child-like remix of a familiar adult-oriented public service announcement. While ‘Cooties’ may not directly relate to chidlren’s books, it’s a friendly reminder of the imaginative possibilities waiting for us writers to explore. Just like “Shrek,” this video dually captivates audiences both young and old. It’s important for us as imaginators to innovate the field and perhaps take something for adults and fill it with the innocence of childhood.